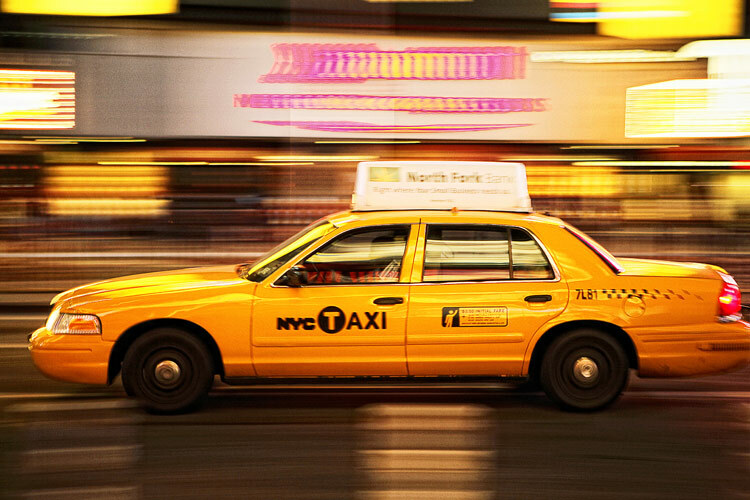 When I was little, I remember saying once that I wanted to be a New York City cab driver when I grew up. That sounds very odd for a young boy to say but to this day I always remember having a love for people watching and seeing how different people react to different situations. Where else is there as much interesting people interaction than in a cab in New York City? They have made TV shows (plural) on different aspects of New York City cabs! Anyway, this image is on my website, and it has been posted a few other places. It is one of my favorites not only for its visual characteristics, but for the story behind it as well. I will mention the technique first. This is a typical panning photograph. If you are not familiar with that technique, it is where you shoot at a long exposure and pan the camera at the same speed and direction as a moving subject in the hopes to get the subject sharp and give the background a good motion blur. If you are familiar with this technique, you know that you will pop off endless exposures only to POSSIBLY get one good one. I think I was successful. I shot this back in 2007 when I was in New York for the annual PDN Expo & Conference. If you ever get the chance to go to this, I highly recommend it. There is a wealth of information in different classes that you can attend in a variety of photographic subjects. They also have a tradeshow that runs the entire week with vendor booths exhibiting many new products. This night in particular was after the last of the classes on my last night in the city. My buddy and I had visited Ground Zero and walked back to Times Square. It was a four hour walk which had us returning to our hotel around 3 am; that was when this was taken. Before we went up to our room, we noticed so many taxi cabs flowing down the streets and proceeded to take shots of as many as we could. Some cabbies stopped or slowed down to “pose” while others (the ones we preferred) just continued on their night as did we. I must have taken close to two hundred shots myself. It was a good night of photographing, to say the least, to top off a wonderful trip to a great city!